Irish historian Ultan Cowley, an Ean member, will give a talk on “The Irish in British Construction: A Symbiotic Relationship?” The lecture will be held at the Irish Cultural Centre in Hammersmith, on 21 February at 7:00 (with refreshments at 6:30). The talk will focus on how the Irish played such a major role in the British construction industry, will explore their contributions, and discuss what cost those contributions came at. 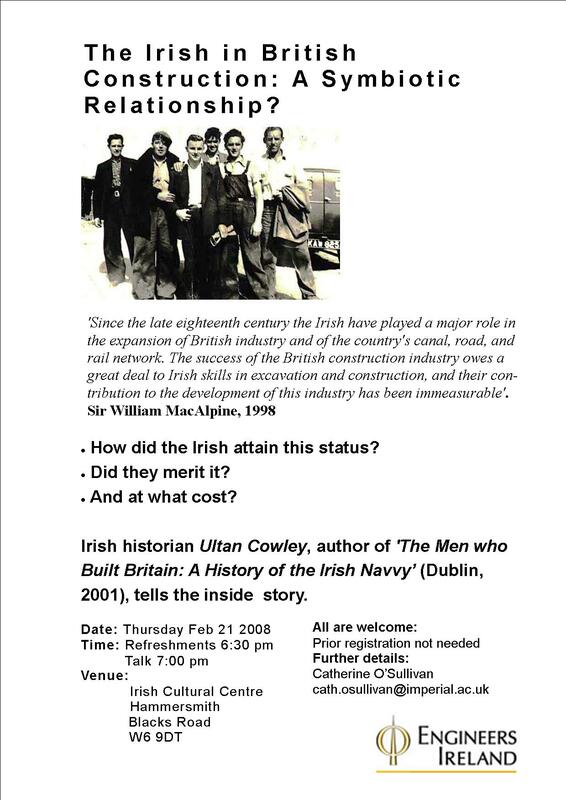 Ultan Cowley is the author of “The Men Who Built Britain: A History of the Irish Navvy”. For more information, click on the flyer. Irish prisoners will not be deported upon completion of their sentences, according to a decision announced yesterday by British Home Secretary John Reid. A campaign by the Irish Commission for Prisoners Overseas and the Irish Government has resulted in the exemption of Irish nationals from the policy, announced last April, of deporting foreign national prisoners. The Irish Commission for Prisoners Overseas, an Éan member organisation, submitted a dossier of more than 30 inmates with strong family ties in Britain. The organisation estimates that there could be as many as 1,000 Irish prisoners in English and Welsh jails. Grainne Prior of ICPO told the Guardian newspaper that many of the Irish prisoners were fully integrated into English life after living there for years; some had families and some had lost all family ties in Ireland. “Many families who contacted the ICPO over the last 9 months have been at their wits end due to the confusion and anxiety around the issue and the continued detention of their loved ones. Today’s statement in bound to bring reassurance and comfort to many”. “I wish also to commend the dedication of the staff at the London and Maynooth offices of the ICPO. They have worked tirelessly to achieve this outcome on behalf of Irish prisoners in Britain, and their families. Contemporary migration brings with it the challenge of upholding human dignity while at the same time we respond to our mission to minister to people on the move”. Siobhan Dennehy of the Emerald Isle Immigration Center in New York was interviewed on Ryan Tubridy about problems facing this year’s J-1 programme participants as well as the services offered by the EIIC. She noted her belief that the organisations operating the visa programme could be more pro-active in offering advice to the students before their arrival in the US. Ryan Tubridy also spoke to a J-1 participant living in Yonkers who spoke of his difficulties in finding a job. He plans on returning home to Ireland after only six weeks because his job search has been fruitless.